When many of us think dog food or treats, we think of the standard dried meats or milk bones. They aren’t the only options, though, and there’s plenty of room for variety. And for those of us who spoil our dogs, it can be hard to keep our doting in check — which often results in pudgy pets with insatiable appetites. 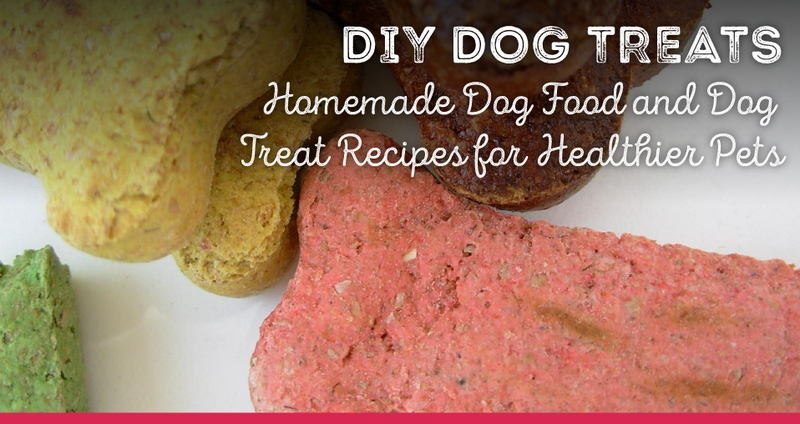 But with a few basic ingredients, many of which are daily staples from your own pantry, you can make homemade treats for your dog that are just as healthy as they are tasty. There’s a lot wrong with the commercial offerings on the market. Many of the more common brands contain harmful preservatives like BHA, as well as excessive amounts of wheat flour or brewer’s yeast. These ingredients don’t do much aside from adding extra calories to your dog’s diet and increase their risk of developing an allergic reaction. To help you and your furry pals out, we’ve put together a guide to healthier dog food, including recipes for homemade dog treats and dog food. Keep reading to learn more! Although we tend to think of the food that we feed our animals as separate from what we eat ourselves, many of the items in your pantry are suitable for dogs. There are plenty of items your dog will love that won’t make them gain weight or fill them up with empty calories. Grains — Low on time and energy? Whip up a quick batch of brown rice or quinoa. Perfect for dogs with digestive issues, whole grains offer quick nourishment and can soothe stomach issues. Oatmeal is another gentle meal for your pet in a pinch. Eggs — High in protein and other nutrients, eggs are a great snack for dogs. They can eat eggs raw, or you can whip up their breakfast along with your own. It doesn’t matter if you boil, fry or scramble, but avoid any seasoning. Peanut Butter — Peanut butter is a fantastic snack for dogs. Not only do they love the taste, it gives them a protein-packed activity because it’s sticky and takes a long time for them to consume. This is especially true if you serve it in a Kong or similar toy. It’s important to remember, though, that nut butters aren’t interchangeable. Almond butter, for example, isn’t toxic for dogs, but it may upset dogs with delicate stomachs. Almonds are not easily digested by dogs, so you’re better off sticking to peanut butter. Pumpkin — Pumpkin is another great option for dogs. Its high fiber content helps keep them regular, preventing both diarrhea and constipation. Pumpkin also contains key nutrients like beta carotene and vitamin A. Some fruits – It may surprise you to learn that dogs can eat fruits like apples, watermelon and bananas. Apples, which are both cheap and perennially available, bring calcium, vitamins C and K, and plenty of fiber. Next time you’re chopping up fruit for a smoothie, save some for your pup — it’ll be a nice break from their meaty dog food. Dogs can also munch on certain kinds of berries. Blueberries are likely your best bet, and they’re loaded with antioxidants, fiber, vitamins and minerals. Blackberries, strawberries and raspberries are also okay in moderation. Veggies – Not every dog loves vegetables, so you may have to hide them among some meat or dog food, but you can’t beat the benefits. And like little kids, once they get used to eating their broccoli, they many learn to love it. Veggies, in general are a great option for dogs, as they have relatively low calorie content and are loaded with vitamins. Aside from broccoli or cauliflower, dogs can chow down on bell peppers, carrots, green beans and leafy greens. Moreover, most dogs enjoy the process of getting a treat more than the treat itself. They just want you to give them something. While there are plenty of foods you and your dog can share, there are some that can be deadly. We’re all well aware of the fact that dogs can’t have chocolate, but there are a few others that may surprise you. Avocado — Avocados seem relatively innocuous, as they’re somewhat bland and chock full of healthy fats. That’s great for us, but dogs can’t partake in the avocado mania that’s been sweeping the nation as of late. Avocados contain a substance known as persin, which is poisonous for dogs. Onions, Leeks, Garlic — All plants in the allium family, which includes leeks, scallions, onion, garlic and shallots, are highly dangerous for dogs and can lead to harmful side effects. These plants can damage dogs’ red blood cells to the point that they can no longer carry oxygen. Eating these plants, whether cooked, powdered, raw or any other form, can also lead to severe anemia that may cause other problems. Xylitol — A sugar alcohol used in diet foods, toothpaste, candy and gum, xylitol can be deadly for dogs. This low-cal additive may induce vomiting, make your dog tired and sluggish and impair coordination. Additionally, xylitol may cause seizures or even liver failure. Chocolate — Chocolate is poisonous to dogs, due to the combined presence of caffeine and theobromine. Dogs cannot metabolize theobromine, which causes it to build up in their systems and cause diarrhea or vomiting in milder cases. In more severe cases, theobromine can cause irregular heartbeats, heart attacks and internal bleeding. Dark chocolate is higher in both caffeine and theobromine and will cause more pronounced effects if consumed. Grapes and Raisins — Raisins and grapes are not safe for canine consumption, and both fresh and dried grapes have been linked to kidney failure. Of course, it’s a good idea to discuss your dog’s diet with your veterinarian before offering them anything new. They may help you uncover some latent allergies, food sensitivities or a tendency to get an upset stomach. For example, some dogs are lactose intolerant, while others can happily gobble up cheese or treats made with milk. Making your own dog food may sound time-consuming and expensive if you’ve never done it before. But it’s surprisingly cheap, incredibly easy and for the most part, a relatively fast process. We’ve included a couple of recipe options here, but both are easy to adjust. Swap beef for turkey or ground chicken, or substitute the grains you have on hand. Low in both carbohydrates and fat, this simple dog food recipe provides protein, a diverse blend of veggies and brown rice to keep your dog regular. And the best part? You can have it ready in about 20 minutes. Place ground turkey in a large pot or Dutch oven along with water and brown rice. Stir gently, breaking turkey into small bits. Bring the mixture to a boil, then cover, reducing heat to medium-low. Let the mix simmer for about 15 minutes, then add pumpkin, carrots, green beans and cauliflower. Stir in all vegetables and let cook for an additional 10 minutes. Serve, saving remainder of recipe in the fridge. Another take on the basic ground meat and veggies dinner, this blend is perfect for dogs with sensitive stomachs. In a large saucepan, add ground chicken and cook until meat is browned. Add chicken stock and oats, stirring periodically. Let cook for about 5 minutes. Stir in chopped veggies. Keep burner on low heat and let veggies simmer until tender. Everybody likes snacks, and that’s especially true for dogs. Here are a few ideas, chock full of tasty, nutrient-packed ingredients you might be tempted to eat yourself. They make great gifts for dog owners, and are ideal for having on hand instead of store-bought dog treats. Wheat-free, with quinoa and sweet potato, these little ball-shaped biscuits are simple, healthy and easy to whip up. Coat two baking sheets with olive oil or non-stick spray and set aside. In a large mixing bowl, beat egg and sweet potato together with an electric mixer until smooth. Add olive oil and continue beating. In a separate (large) bowl, combine quinoa and rice flour. Slowly add sweet potato mixture to the dry ingredients. Stir in water. Once thoroughly combined, fold blueberries into the mix using a spoon or spatula. On a cutting board or firm surface, roll dough into ball shapes. It should make about 24 balls, give or take. Arrange on baking sheets and place in the oven. Bake for about 35 minutes, or until the biscuits are crispy around the edges. Tasty and nourishing, these dog biscuits provide dogs with one of their favorite snacks on the planet — bacon. While bacon isn’t the healthiest options for dogs – or for people – your dog is guaranteed to love this simple recipe. In a large mixing bowl, combine coconut flour, wheat germ, and flax seed, gently stirring together. In a separate bowl, whisk eggs together, and add bacon grease and oil. Add the wet mixture to the bowl of dry ingredients, then stir in the water and bacon bits. Grease a large baking sheet with a bit of vegetable oil or non-stick cooking spray. Roll out dough and cut into desired sizes — either rolling into balls, or using a cookie cutter. Arrange dough on a large baking sheet and bake for about 30 minutes or until cookies are dry and crispy around the edges. Store biscuits in an airtight container—a cookie jar or FridgeX container works great. Similar to getting kids to eat more vegetables by adding them to smoothies or pasta sauce, these treats will help your dog get a serving of vegetables without even realizing it. They’re made with cruciferous gems like chopped cauliflower and broccoli, and give your dog a break from their meat-centric diet. Grease a large baking sheet with non-stick spray. Add in oats and brown rice, stirring gently. Then, add carrots, broccoli, and cauliflower. Knead dough together until all ingredients are evenly distributed. Flour your desired work surface and knead the dough. Roll out dough and cut with cookie cutters or into small shapes. Arrange cookies on your greased baking sheet. Stick cookies in the oven for about 20 minutes. Remove from heat and let cool for at least 10 minutes before serving. Keep extra treats in an airtight container. If anything, we hope you’re inspired to give your dog’s nutrition a little extra thought. Many people find that occasionally feeding their dogs homemade food helps them save money. Plus, when you make their treats at home, you can be sure that you aren’t feeding them any potentially harmful preservatives. At Ceramcor, we have everything you need, from non-stick frying pans for whipping up eggs to bakeware you can use to bake tasty treats for both you and your pets.